Even though I haven't baked or blogged for a while I have still been indulging in many a sugar filled treat. Giant Jaffa cakes, dairy milk, speculoos and custard creams to name a few. So when I saw recipes for nourishing cakes filled with fruits, nuts and natural sugars in this months Women's Health, I thought I'd give one a go. I chose to make the lemony hazelnut and blueberry cake as it sounded similar to the Hummigbird blueberry and lemon bundt that I love baking. My brother always asks for the 'one with blue spots'! With blueberries and hazelnuts these cakes are packed with vitamin E and anti oxidants, perfect for skin. Something I struggle with being a sweet treat fiend! Toast the hazelnuts in the oven for 5 minutes. Leave to cool for a few minutes before removing any skins and blitzing in the blender into a fine meal. Sift the flour and baking powder into a large mixing bowl. With an electric hand mixer, beat in all of the other ingredients. Be careful not to overmix to keep the cakes light and fluffy. Divide between the muffin cases and bake for 20 minutes or unil a skewer comes out clean. 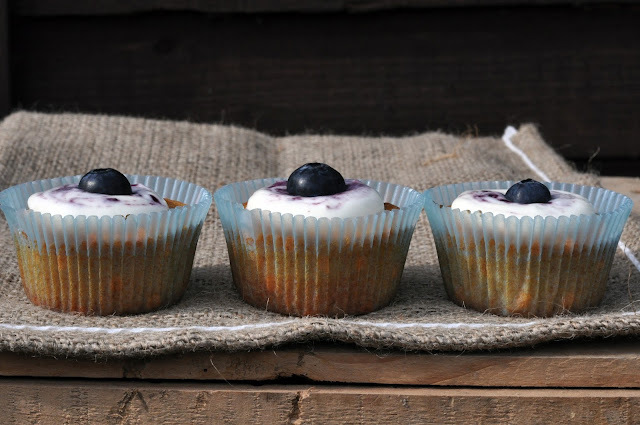 Swirl in blueberry jam and top the cooled muffins with some of the yoghurt mix and fresh blueberries. The recipe in the magazine makes a sandwich cake, but I decided to divide the mix into a dozen muffins to try out my new Wilton muffin tray!